There were 608 press releases posted in the last 24 hours and 153,539 in the last 365 days. BONDI BEACH, NSW, AUSTRALIA, May 31, 2017 /EINPresswire.com/ -- It’s a problem that millions of women struggle with, but which has been largely ignored by the fashion industry until now. While the majority of sunglasses are designed to fit caucasian women, very few sunglasses fit women of Asian-origin properly. 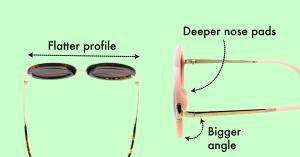 - A greater angle between sunglass arm and lens, so that the sunglasses sit away from the wearer’s cheeks and don’t rest on them. - Deeper nose pads that sit on lower nose bridges. - A flatter front profile, more aligned with the contours of Asian faces.